• Size: Three 18" x 24" panels. Final Size: 24" x 54" x 0.75"
• Support: Staples-free gallery wrapped stretched canvas., museum style quality. • Ready to hang, edges are hand painted using same colors and style as the front art. • Protection: Protected from UV rays and other elements with a final coat of glossy varnish. but if you want it signed on the front too, please email your request specifying where to place the signature. If no message is received, the painting will ship signed only on the back. • Certificate of Authenticity signed and dated by the artist included. @2013 Farias Fine Art paintings are copyrighted and may not be reproduced in any form. 24x36 Original Abstract Painting. Acrylic on a Canvas. Modern Black & Red Fine Art by Federico Farias. 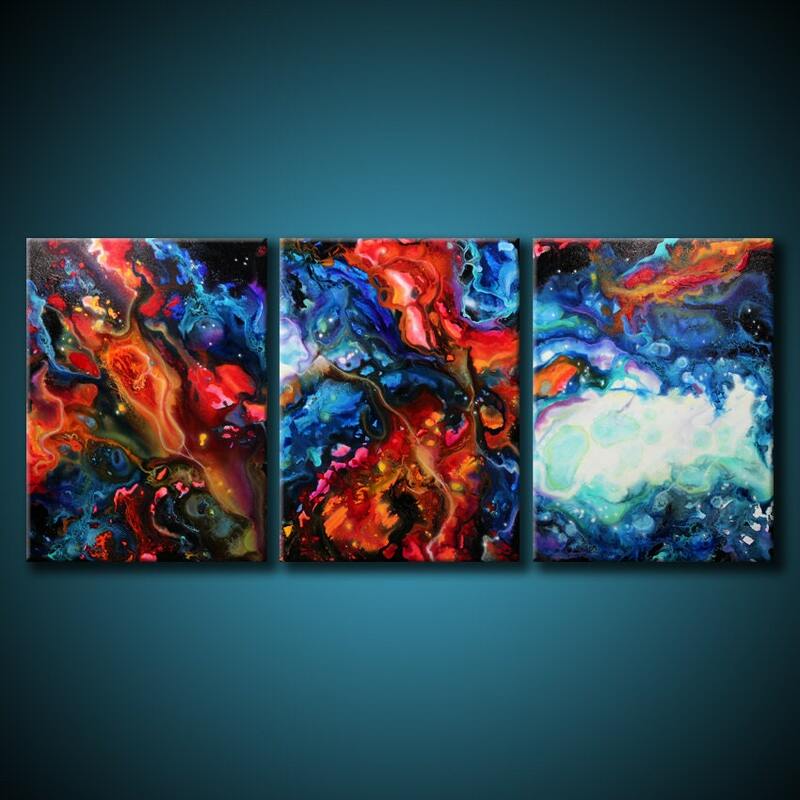 Original Abstract Painting. Acrylic on a 24x36 Canvas. Modern Colorful Fine Art by Federico Farias. LOVE, LOVE, LOVE!!! Gorgeous work, perfectly packaged and so very prompt and wonderful communication by the artist. I loved so much I bought another right after receiving this one! Amazing piece of work. Looking forward to more purchases from this artist in the future. Packaged well. • Direct Payment & PayPal is the preferred method of payment. • Money orders and Personal checks are also accepted. Note that the paintings will not ship until payment has cleared. • Payment on local pick up also accepted (cash only). Returns are accepted. Painting must be returned within 3 days after the buyer receives it. Refund will be given as money back, but shipping will be deducted. Buyer is responsible for the charges of the return shipping, painting must be returned in it's original condition. • Flat shipping to lower 48 US states only. • International buyers, please contact me before making the order so I can calculate your shipping costs. • Painting will be shipped 3-5 days after payment has cleared, and shipping transit will take 3 to 10 days, depending on your location. • Each painting is protected with bubble wrap and packed with extra care in corrugated boxes. Do you want a custom painting? Please email me your request and I'll send you a quote, I'll be happy to create a special painting just for you. If by any reason you are not completely satisfied with your purchase, please let me know ASAP and I'll work with you until you are. 24x36 Original Abstract Painting. Acrylic on Canvas. Modern Colorful Fine Art by Federico Farias. 24x36 Original Abstract Painting. Acrylic on a Canvas. Modern Colorful Cosmic Fine Art by Federico Farias.